When a patient feels ashamed to show his or her arms in a short sleeved shirt, an arm lift, or brachioplasty, is a viable option. This is when Seattle area plastic surgeon, Dr. Marosan, will remove the saggy, extraneous skin on the upper arms through skin removal or liposuction. When loose skin is the issue, then Dr. Marosan will simply make an incision and trim away this unwanted skin. When there’s abundant fat as well, he will use liposuction to remove the fat. After an arm lift, the patient will be left with smaller, more toned, shapelier arms and better confidence. The goal of an arm lift is to result in a toned upper arm appearance. The length of the incision varies depending on how much skin and fat are to be removed. Patients who have a fairly good skin tone may only require a minor incision. However, patients who have excessively loose, hanging skin will require an incision that may run from the armpit to the elbow on the back of the arm. At this time, the excess skin is trimmed and the underlying fascia is tightened around the muscles. In some patients, the armpit will also need to be addressed and surgically tightened. "Arm Lift - In 2009 I was diagnosed with breast cancer that had spread to my lymph glands. I had a lumpectomy followed by radiation. A year later I had a lat-flap reconstruction that went terribly wrong. I was left with a totally deformed breast and it was actually painful to wear a bra for more than a few hours. The good news...I was cancer free! I decided to celebrate by having a much-needed arm lift but was terrified of getting lymphedema. I had consults with 4 surgeons. One told me there was absolutely no danger of getting lymphedema from an arm lift. The next refused to consider an arm lift because of the chances of lymphedema. A third told me he would operate if I wanted to "roll the dice." 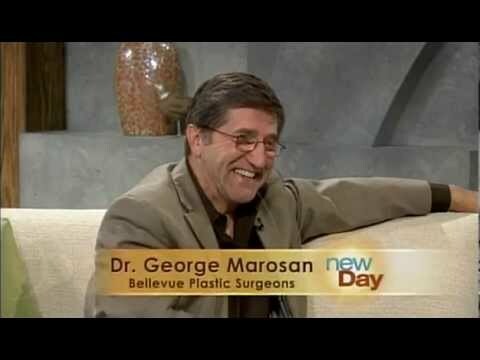 And then I met with Dr. George Marosan (who, by the way, did not charge me for the consult). I expressed my concerns regarding lymphedema. He suggested a rather unique way to do an arm lift and, at the same time, use some of the excised fat to graft to the hard, ugly scars on my breast. These scars were dark, hard and wide. He said grafting fat to the scars would soften them. For the arm lift, he would do liposuction first. A year later he did the arm lift without any incisions in the armpit. I have seen some real horror stories in Real Self of gapping incisions; infections, separations, necrosis, etc. I had absolutely none of that and my incisions healed beautifully. I cannot say enough good things about Dr. Marosan and his wonderful staff (expecially Eden and Danielle). Dr. Marosan really takes pride in his work and listens to his patients. He addressed my concerns and gave me back arms that matched my body. He even made it where I can wear a bra all day long. How cool is that!!?!" Patients undergoing brachioplasty are under intraveous sedation and tumescent anesthesia. It is an outpatient procedure that takes an average of 2-3 hours to complete. If the procedure is a part of an after weight loss surgery, Dr. Marosan often combines an arm lift with a breast lift. After surgery, the arm is protected with a compression garment. No drain tubes are used. Swelling and bruising are normal. Patients should keep the arm elevated to promote blood circulation and help with swelling. With proper care, the arm will return to normal function after 2-3 weeks. Any patient who undergoes an operation where skin is excised and incisions are made should understand that scarring is a part of the procedure, including brachioplasty. We make every effort to ensure that the scar will be as minimal as possible. For post-surgery care, topical ointments to assist in scar healing will be prescribed. It is also recommended that patients avoid sun exposure during the first year to protect the incisions from any additional discoloration. Most patients believe the benefits of a more toned arm outweight the appearance of scars. It is common for arm lift patients to combine this surgery with another procedure. This is sometimes referred to as an upper body lift and may include liposuction, abdominoplasty (tummy tuck) and breast surgery (breast lift). During the consultation, each surgery will be discussed and recommendations will be made as to whether these procedures can be done at the same time. An arm lift is performed to remove hanging skin and fat. If a person has a lot of fat on the arms, Dr. Marosan prefers to do liposuction first. This can be done under local anesthesia. At this time, he contours the deltoid muscles and biceps.The only way to build actual muscle is through strength training. Following surgery, once the arms are fully healed, patients can begin weight training if they wish to do so. This is a great way to add shape to the arms by toning and strengthening them. Patients should maintain a healthy lifestyle that includes diet and exercise in order to avoid a recurring weight gain, which could compromise the surgical results.